Does someone in your family love animals or perhaps someone in your family needs to learn more about animals?? Well – This capsule created by The Global Guardian Project is one for you to give a go. We loved exploring the different animals written about in this capsule and learnt so much about what endangered actually means, how animals become endangered and how we can help them. This capsule provides many outside links to different associations who help these animals – which really resonated with my children. They found it empowering to see that people were making a difference in the world and it helped them to see that they too can do something. This capsule also provided Geometric colouring pages – a different way to colour in and a world map to print out (we didn’t print it but instead drew one) and pinpoint where the different animals in this capsule were from. The Global Guardian Project is a great way to educate and empower your children about the world around them AND they have just released a Junior capsule for younger children. I am offering a special code – GGPVANESSA for you to use and receive a 10% discount on any capsule you wish to trial. Interested in learning more about New Zealand? Then this might just be the capsule that starts you and your family on your journey to becoming a Global Guardian. I’ve been to New Zealand but what was contained in this e-capsule opened my eyes up to many things I didn’t know about this beautiful place. As you work through this capsule you will learn about endangered animals who are being cared for by conservationists and scientists, learn about the traditional culture of this island which still plays a large role in modern society and some modern day change makers. Your children will love the colouring in pages that support the written information about the yellow eyed penguin, guided meditation to help children learn to be still and appreciate the sounds around them and within themselves and a simple action challenged to make you think more about the single use of balloons. Children will delight in the images and stories of other young change makers and perhaps inspire you to jump online to see more of New Zealand or perhaps even a trip there one day. The e-capsules created by the Global Guardian Project are written to inspire global awareness. We all need to be aware of who also inhabits the planet with us and that we can al make small and meaningful differences to make the world a better place for all. You won’t regret it and your children will love it! Have you ever wondered what is underneath the grass you walk upon? Have you ever scooped up some dirt and examined the life that teemed out of it? Have you ever noticed the different colours of soil on your bushwalk or sand at beach? 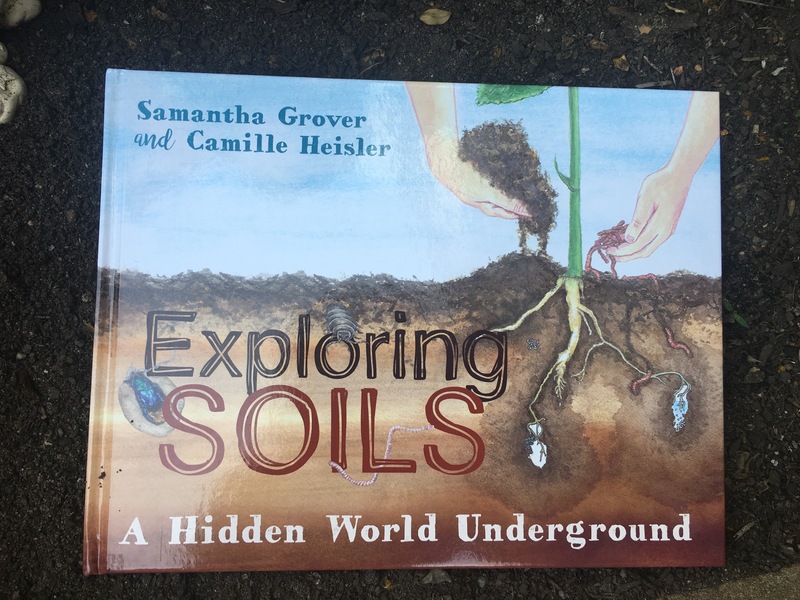 Exploring soils by Dr Samantha Grover and Camille Heisler is a informative picture book that takes us on a journey through a young child’s eyes as they explore how plants and animals live in soil, how soils are formed and how they are essential in our lives. 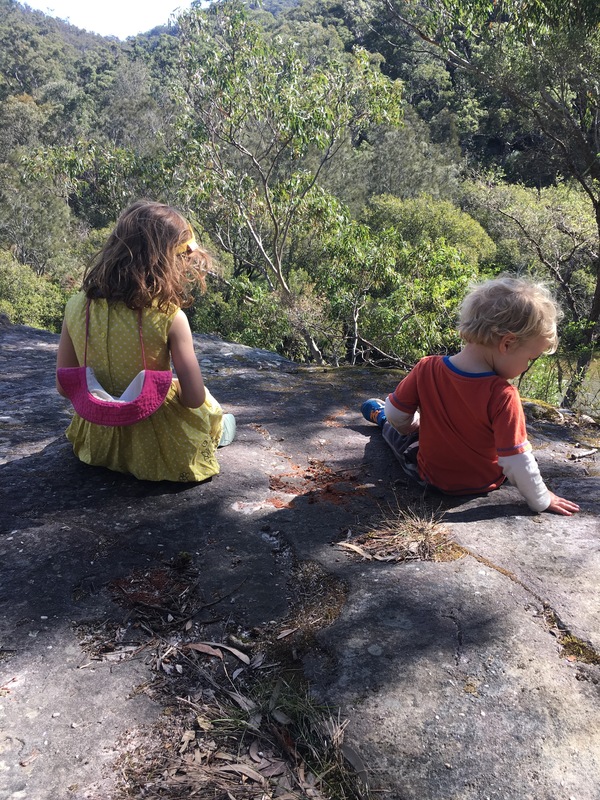 Having two young children I have rediscovered the joy of dirt – yes really! Although it does create mess, there is so much to see inside of it. As we dig in our backyard or down in the local park we have discovered so many interesting insects, old junk and pieces of rock. The collaboration between Grover and Heilser is remarkable. As facts are brought to life through story, the illustrations match so that we can see the layers of soil, see the tiny legs on the insects and learn how water moves through soil. The importance of soil is shown to the reader as we learn about gardening, using clay for bowls to eat out of and even different ochres that allow us to paint. 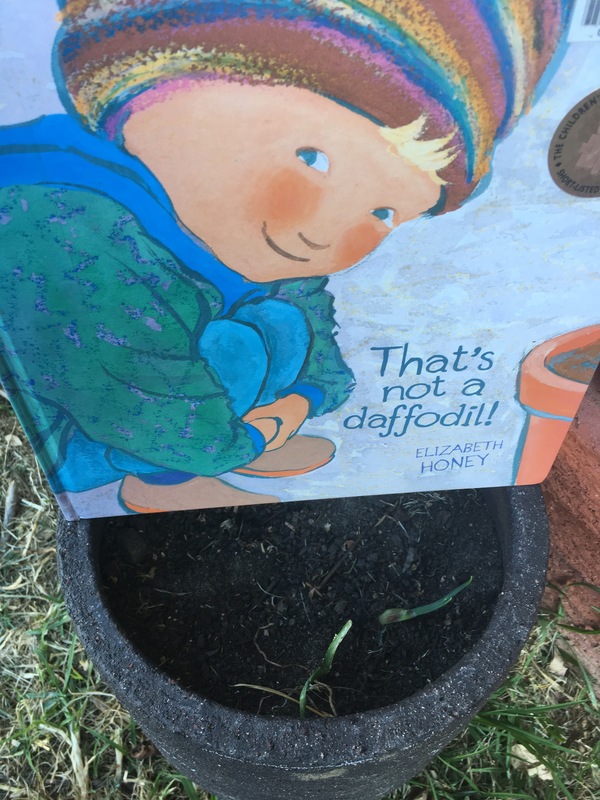 The idea of being a soil detective is not out of reach for any young reader and in fact I found this book a great way for children to take a closer look at the soil. There really are hours of discussion to be had around soil and this book is a really great way to start that discussion. Without healthy moving soil we would not have the planet we have today! Go outside and dig a hole! Start with a small hole and see what is in that space. Write down what you see, draw what you see and compare different spaces around the backyard or park. Learn about the soil that is in your area and how it is different from soil in another part of our suburb or city. Explore why we need healthy soil by conducting an experiment. Try to grow some sunflower seeds in sand, rocky soil, old soil and fresh new living soil. Which one grows best when all given the same conditions? BUY NOW – click below. Does your child know how flowers grow? Do they know that all flowers were once seeds? Not understanding the time it takes for a seed to grow into a flower or the things you need to do to nurture the seed so it grows, young Tom is always bewildered when Mr Yilmaz refers to the pot of dirt with the bulb inside, as a daffodil. As we see the bulb slowly grow, we also read creative similes, metaphors and figurative language that cleverley describe the daffodil in each state of growth. The relationship between Tom and Mr Yilmaz also blossoms as the daffodil grows, just showing how simple acts of kindness can lead us to learning about someone we may not have always chosen to know. That’s not a daffodil by Elizabth Honey was a CBCA shortlisted book in 2012 and is definately one for the home bookshelf. It not only teaches children about plant growth but also the importance of patience, kindness and the ability to see beyond the simple picture. Grow some seeds. Find some pots and plant seeds and watch them grow. If you can, keep a seed diary so your child can monitor when the seed is watered and how long it will take to grow into a plant. Learn about the life cycle of a plant or an animal, discover how long other things take to grow and what they need for survival. Imagine a world without regular rain or temperatures that are too cold – what might happen to plants that rely on rain and warmth? Enjoy some green space and digging – it is a wonderful activity for the soul. Today is National threatened species day and a great day to pull out a book so you can learn more about an animal that is in need of help. What is a threatened species? A threatened species is an animal or plant that has numbers which are becoming lower. This could be due to loss of habitat, feral animals or disease. This day is celebrated in order to raise awareness of how we can start to reverse the decline in numbers and reflect on the past – where we have let animals become critically endangered or extinct. CLICK ON IMAGE TO BUY FROM FISHPOND – FREE DELIVERY! Create a poster to share with others – check out my blog post on this activity. Write your own stories about an endangered animal who has been saved just like Rhino in the House or Phasmid or The Hairy Nosed Wombats Find a new home. What will do to to help children learn more on threatened species day? LOTS. The diversity of life on Earth by Nicola Davies. LOTS. The diversity of life on Earth by Nicola Davies and illustrated by Emily Sutton is a creative, eye catching non -fiction picture book that conveys the message of the amazing diversity of life we have on our planet Earth. Nicola Davies invites us to look everywhere and when we do we will find so many different types of life. Through magical storytelling the reader finds out small facts about different creatures, how they live, how many species there are and where they hide. Emily Sutton illustrates with care, bringing the natural world into focus and helping us to se the intricate details of each animal, plant and insect. LOTS is a great book to ignite your child’s interest in animals and perhaps a future in animal and habitat conservation. LOTS is a gentle way to teach children about the importance of all life forms and how we all play a role in caring for them. An informative and entertaining book, LOTS is one for the science lesson, literacy lesson and just the quiet book before bed. Before you read – write down three things you know about life on earth. After you read – write down two facts you learnt. Write down two things you would like to know more about. Write down two ways you are going to help make sure no more animals become extinct. read about an animal in this book who has become extinct. Work out why they became extinct and actions that may have saved them. List and group all of the different animals in this story. How many groups of animals are there? Look at the page on food/life cycles – can you investigate other animals and how they link in with each other for food and life? Donate money to an organisation or do some volunteer work that would help restore habitats for animals. Use this book as a springboard to help your child to be aware that everything they do makes an impact. Every piece of rubbish, every flick of a light switch and every trip in the car impacts another. How can you make a difference as a family? Have you ever felt like the world you live in lacks green? Or perhaps you can’t remember the last time you saw a flower bloom or a butterfly flap past. 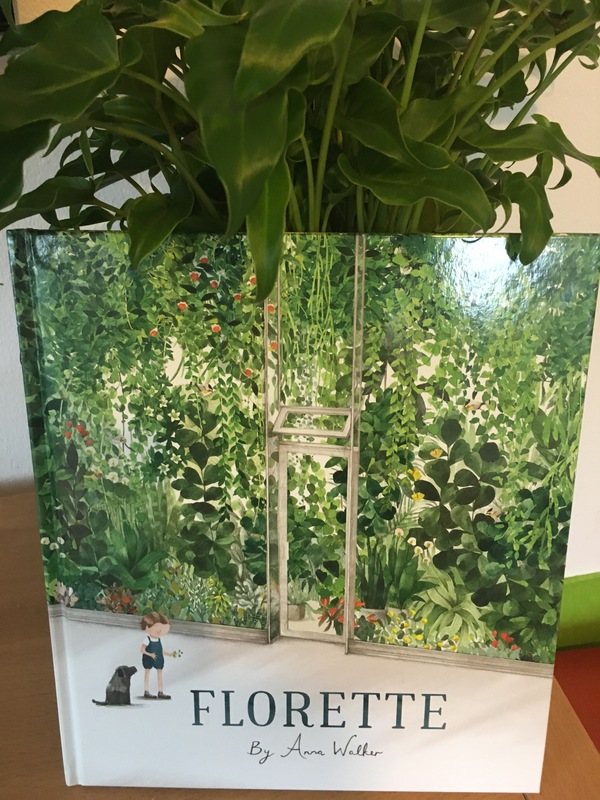 Florette by Anna Walker is just the book to read to inspire you to turn your world from grey, brown man made landscapes into luscious green spaces that encourage laughter and love. Mae’s family moved to a new home, away from friends and her garden. Mae misses the apples trees, daffodils and leafy cubbies. She misses the wavy grass, daisies and space for a swing. Until one day she discovers a Florette and a small stalk of plant. Mae doesn’t know where the stalk will take her but she has a new spring in her step, hope in her heart and inspiration in her mind. Anna Walker’s illustrations bring this story to life as we watch Mae transform from the dull grey landscape into the living green space she creates. Florette is a beautiful story for those who might live in a world of grey, showing that with a little inspiration we can all have our own green patch. Grow your own seeds: Grab an old egg carton and some seeds (use apple seeds, tomatoe seeds or store bought seeds). Place some tissue in the carton and then place a seed on the tissue. Cover with another layer of tissue and add water. Where are the local green spaces in your area? Find them – can you walk to them? What is the purpose of a Florette? Investigate any local Florette’s in your area. Grow a new plant from the graft of another plant. Investigate which plants can do this – you will be surprised! – How do they both feel about their new home? New view? New lifestyle? Find images and words in the story to help justify this. – How would you feel in this landscape: What would you do? Draw your viewpoint. – Compare the different points of view. How and why are they different? Use a Venn diagram to compare differences and justify these differences through quotes. Draw the differences of what they might see out the window. – Create an image to recreate from both Mae’s and the mothers point of view. How might they see the garden differently? The new house? Are each of their view’s fair on each other? Could one viewpoint overtake the others? What would it mean if one viewpoint was to disappear? Plan a garden of your own in a space in your neighbourhood or backyard! 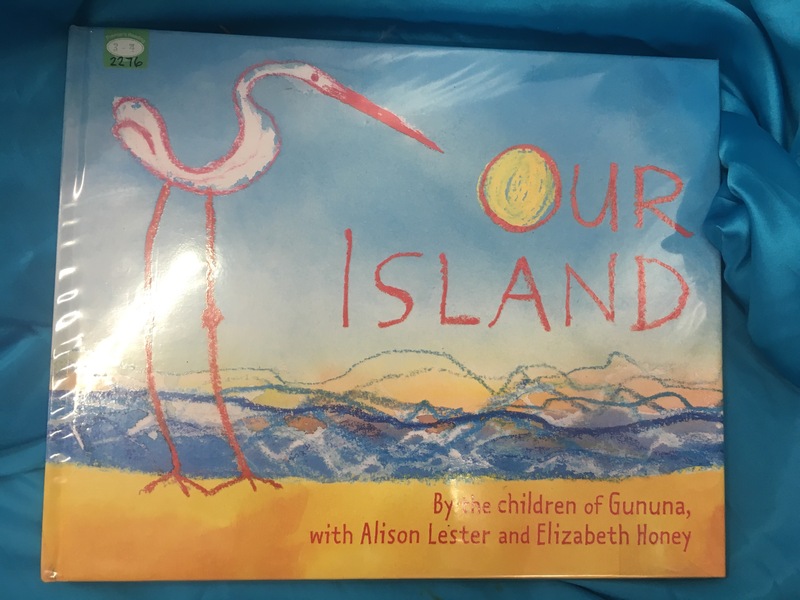 The children of Gununa alongside Alison Lester and Elizabeth Honey have created this picturesque story that shows outsiders the beauty of Mornington Island and the link the Indigenous people have with the natural world around them. Sunrise, Sunset and the hot summer sun are all depicted through the eyes of children alongside the poetic nature of the words. Simple crayon and food dye techniques are used to create a natural feeling of the island and its people. Our Island helps readers to become more aware of the rich indigenous culture that Australia has and the beauty of places untouched by development. By sharing this story with someone you are making their world a bigger and brighter place. Who are the children of Gununa? Can you find out the same words for the tribe who did or still does inhabit/ed where you live? How do indigenous people live with nature – how does this help the environment? Who is Alison Lester and Elizabeth Honey? What do you think life would be like for the people who live here? Compare your ideas from the start of the book. What do you think people do on this island? Are there people on this island? Why is it not mentioned in the story? How do these people feel about the natural world? Create a book just like this to show your town, your city, your island, your bushland, your ocean etc. Do you think you would need to mention people? Can you leave people our of your space like this story does? Compare and contract the children of Gununa to your life. Think about the differences and how you would both feel living in each others community. 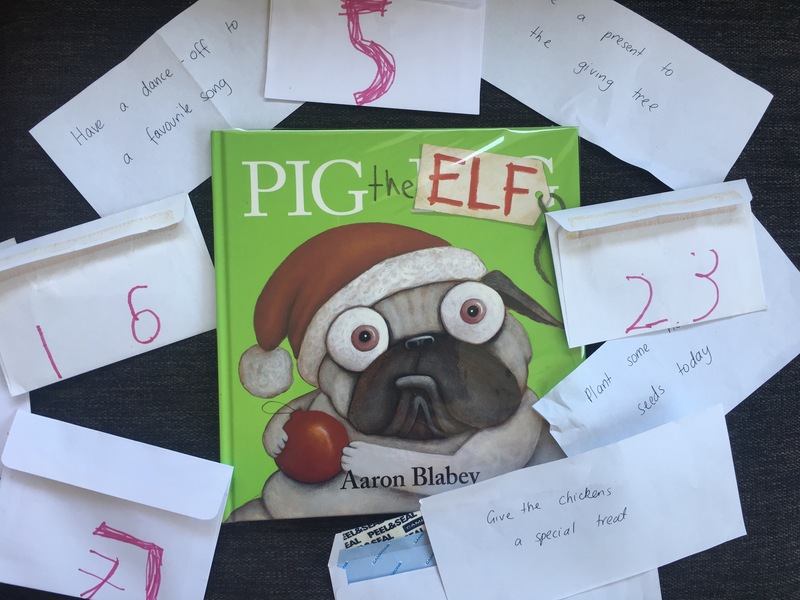 Pig the Elf is another humorous tale written by Aaron Blabey of a pug called pig and his misguided ways. Pig is very self centred and only thinks of himself and the wonderful gifts he will be getting from Santa. There is no Christmas spirit in Pig and his wish list is metres long! (and quite entertaining). Luckily for the reader, Pig’s selfish ways are dealt with in a humorous fashion with the word BUM getting a good laugh at! Now Pig the Elf is by no means a book about sustainability or eco living BUT it made me think about how we can get very caught up in what we want for Christmas! We need to encourage children not to get caught up in the material side of Christmas and this can be tricky with advertisements ramping up, toy catalogues in letterboxes and other children talking about what they want. Rather than not giving presents (which is quite harsh at this time of year!) try to discuss how we can have a more waste free christmas. There are so many fun ways in which you can create gifts that have a lot more meaning. Make your own wrapping paper out of scrap paper. Give an eco gift – backyard chooks, worm farm or compost bin! Donate to a charity which helps others or the environment. A change in mindset is possible and I am sure even Pig the Elf could change his mindset if someone sat down with him and helped him to reflect on himself……but then we wouldn’t have anymore humorous tales from Aaron Blabey for next year, would we? So you might have a child who is not interested in reading books and are wondering what you can do to engage them in literacy? My first question to you would be what sort of books are you reading with them ? Picture books are a fantastic place to start any child who is not interested in reading. But make sure you involve your child in the process of choosing books. Find out what they interested in and seek out books on that topic. If your child would prefer non fiction books, by all means, go to that section of the library! Any reading is a step in the right direction! it could be comic books, lego instructions – (now you may be thinking that there are no words here but literacy isn’t always about reading). It is also about understanding diagrams, listening to instructions, retelling stories and following directions.., so also try recipes – Try anything and find out what your child loves doing and go from there. How else can you engage your child in literacy? Just in conversation with your child anywhere you can ask them “I wonder what sound tree/car/football starts with? Ends with? This can be done with billboard signs, at the supermarket. Play a clapping game where they need to clap out the syllables in their name – this will help them later on with spelling and sound chunking. Write words outside with chalk, in the sand/dirt or mud! Ride over words – following the letter with a tyre of a bike or scooter. Play eye spy in the car using sounds and colours. This game is great as it isn’t just about sound/letter recognition it is also about listening to instructions. Make sure you don’t just focus on the name of the letter – focus on the sound. There are letters that make different sounds so make your child aware of that. Tell stories – make up imaginary lands and ask your child to join in with the storytelling process. This develops their talking and listening skills as does talking about what they did during the day. Encourage them to make their own book. Staple some scrap paper together and they can write or draw anything they wish and then tell it to you. So just remember that literacy isn’t just about reading books – it is about talking, listening and writing as well. Make literacy fun and your child will find the way that they enjoy it too. The importance of nature play. There is a lot of new research coming out on the importance of play and the importance of play outside. As a teacher I have always observed children learning best when they are in a relaxed and informal environment. In saying this, there is always a place for teaching and mentoring but there is also a place for exploration, making mistakes and collaboration. I love being outside – it just makes me happier. I love being in natural areas where there is less human activity and more time to sit back and admire what is around us. So when I became a librarian I couldn’t think of a better way to get children outside than through books! Research shows that playing outside increases happiness, problem solving and motivation. When children play outside they use more imagination as there are less boundaries, they can problem solve and they can learn about the world they live in through their 5 senses. Now, you often think of books as an inside activity – which they can be (and often are) and this is fine BUT what if we can take ideas from these books and use them to inspire some outdoor play? Here are some books which might inspire you to take a trip outside! This is a classic book that we all know and love. It is so much fun to read and sing to and is a favourite of ours. After you read this book, with your child you can…..
Go on your own bear hunt! Find some swishy grass, splashy water and sloshy mud – lots of fun! Can you go on a native Australian animal hunt? Which animals live in your area? Pack a bag and go on a short hike. Think of the different things you need to cope with storms, rain, wind and sunshine! The worm who knew karate By Jill Lever and Terry Denton is a hilarious book about a worm who decides to become a braver and stronger worm through the art of karate! Which made me think….how can we help our children to build their confidence? And what do those worms in my worm farm really get up to? Maybe it’s a secret dojo I have never been aware of…. go and dig up some dirt – find some earth worms! Go and buy a worm farm or explore your local community garden worm farm. Feed the worms – what do they like best? One boy’s quest for a greener world, one garden at a time. The Curious Garden by Peter Brown is a book based on fact. The Highline is an abandoned railway line that people began to take back over and return it back to nature and open spaces for people to enjoy. It is a poignant book as many cities, suburbs and towns are starting to explore how they can become greener, literally. Look at a local park or your own backyard and redesign it so there is more growing and more green. Make an inventory of the nature in your area. Discuss biodiversity of plants and animals. Mechanica: A beginner’s field guide by Lance Baldachin is a picture book for those who love the earth but wonder what is to become of it if we keep treating it the way we do. It is circa 2250 and the earth is devoid of any natural life due to human destruction and consumption. However, mechanical creatures have been made to replace what was lost – though these are not always as kind as they look! Find some insects and sketch them. Look at how they move their arms and legs. Try to recreate an insect out of natural material. Create an insect house for your local insects. Many insects are lacking in city gardens as there are not enough small holes for them to live in. Look for signs of life cycles of insects – these can be hard to find but it will make your child look in the small places that we often overlook. The Bogtrotter is a delightful creature that lives in the bog – a gloomy, marshy, mushy bog! Bogtotter, written by Margaret Wild is a book that focuses on belonging, trying new things, playing outdoors, loneliness and discovery. The illustrations by Judith Rossell are marvellous, really bringing to life the Bogtrotter and his feelings. The reader steps through into the life of the Bogtrotter, watching him start off doing the same thing every day, not knowing how to make a change. It is through talking to other animals around him and picking a flower that he sees that there is more to his bog. Go to a new park, a new national park or any outdoor space. Walk a path you walk everyday but do it slowly and try to notice the small things as you go along. Talk to people, say hello and notice what is happening. Take something outside that you normally do inside – does it make a difference? I loved reading Incredibilia by Libby Hathorn and illustrated by Gaye Chapman to my children, the pictures really transport you to an imaginative world full of crazy creatures, whispy clouds and natural beauty. We loved looking at each page and imagining what Georgie was thinking about, what she was playing and how the others could play to. Take some ribbons, balls, string and scraps and see what you can do with them outside rather than a specific toy. Create new names for the local insects, trees and flowers in your garden or local park – imagination! Go somewhere or find something that you think is incredibilia! Perform a puppet show outside with leaves as the characters – draw on them and create a story! What can you grow out of different substances? Explore how seeds grow and what they need to grow. How heavy are different trees. Use problem solving to try and work this out. There is more to a season than just a change in name or change in our clothes – but do city dwelling children know this? The weather plays a big role in our lives. As a modern day city dweller the weather affects the clothes I wear, my daily activities and my choice between thongs or gumboots as I run outside to feed the chooks. BUT for many seasons play a vital role in survival. Weather effects growth of food, healing of soil, hibernation of animals, plants and insects, movement of land and traditionally movement of people. Walking with the seasons in Kakadu focuses our learning towards the seasons of the Top End of Australia. As we walk through the story we learn how the people feel with each changing season, what happens in that season and how they prepare for the next. This story is full of rich illustrations and the information is presented to the reader in small easy to digest format spoken by members of the tribe. Although this book is set in the top end you can relate it to your own environment. 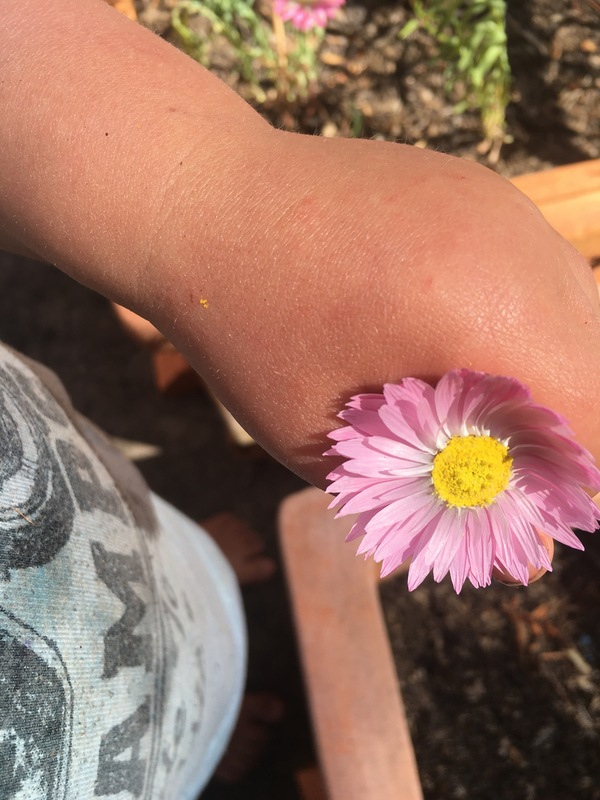 You can help children become more aware of the seasons around them – take them and show them there is more to a season than just a change in the name. Go outside and watch buds grow, notice the different insects that come out at different times of the year, and keep a photo diary to remember and compare. How can we link this to our students and children at home? – Go outside at least once a day and take notes about a tree, grass patch, small srhub. Note the change in leaf colour, insect and animal behaviour around the plant, smell in the air, bud appearing and soil texture. – Purchase a rain guage and outside thermometer – children will love to see what the temperature is at theie house as compared to the local weather report!